2015 Hobo Wine Company “Camp” Chardonnay, Sonoma County. 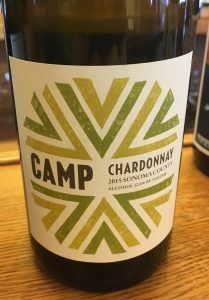 Winemaker Kenny LikItprakong created the Camp line of wines in 2013 to highlight value in Sonoma County and craft interesting varietal wines, and he makes Zinfandel, Cabernet and this pristine and lovely Chardonnay. This fresh styled Chardonnay is 98% pure Sonoma Valley and Alexander Valley Chardonnay and 2% Viognier, it was natural yeast fermented in stainless steel then transferred to neutral, well seasoned, French barrels to finish Malo, which ended up at about 10 weeks, everything done was designed to preserve freshness and purity of detail. All the vineyards sourced were (are) organic or sustainably farmed and the results are not only a success, but make for an impressive Chardonnay with class and vibrancy, this may not go down as a legendary wine, but it is a brilliantly drinking Chardonnay that tastes for more distinct than many in the $50 range! At a wonderfully low alcohol of just 12.6% and with bright mineral tones this Camp Chardonnay is vibrantly refreshing, and has many similar qualities to a fine Chablis, but remains a true California example with lively apple, pear, wild peach and lemony fruits with hints of cream, golden fig, clove spice, key lime and subtle tropical elements. The acidity is fine and smooth and subtle brine and stoniness help balance it all out, you won’t need to think to much, this is a beautiful quaffer to enjoy with friends and cuisine, even those that usually pass on Chardonnay will be intrigued, and those that do will love this even more. Drink this clear and well made wine over the next year or so, one of the best under $20 Chardonnays I’ve tried, along with Signal Ridge Vineyard of Mendocino, well worth exploring!